Life is good on two wheels... The story is to be shared. Jeff Kurtz. KurtzInPA on Facebook and Youtube. Happy day! The refurbished camera arrived yesterday afternoon. (yes, I searched... there aren't any new 5DMIV threads so I don't feel hesitant to start one...) There's a ton to figure out so I'll keep expanding this paragraph as I go. Will copy it to my blog so there's something for searchers to find. First impression: Looks remarkably like my 7D. Little bit lighter weight. The primary control buttons are in the same places but a few are re-labeled. "AF-Drive" became "Drive-AF" and a couple similar ones. Some white labels became muted or blue (reasons to squint?). the CA stop on the rotary dial is gone and there's a "lock" button in the center of the dial that prevents accidental rotation (nice addition!). 1ST HUGE notable improvement. The data transfer ports are upgraded to USB-III! That, in itself, just paid for this camera... The older style port on my 7D (Mini-B) is what failed, leading to my making this purchase. Remind me to purchase a spare cord... I'm famous for leaving cables in motel rooms. Uses same battery as 7D! That's a first. I could operate a powerplant with all the obsolete camera batteries laying around here. Two card slots. One for a compact flash and one is a SD. I haven't figured out how to configure them yet so I don't know if it's an automatic backup or other options. Starting with the Menu screen, the 5D looked simpler. Fewer options on the front page. BUT,,, the drill-downs are huge. Will take quite a bit of exploring. Thus far I found most of the settings that I usually tinker with. The Owners Manual is daunting. Almost like the first day in PhotoShop. I'm on page 149 and still in the AF topics. All sorts of tracking and metering options. Would have been handy shooting the air races last summer. One side note: I investigated the 5Ds briefly, because of the 50M resolution. The factory people asked about my typical shoots and explained that the 50m data capture slowed the frame burst rate and might disappoint me shooting action sports and such. Small price to pay when the 5D 30m is almost twice what I am used to. OK... now back to the operators manual to see what else I don't know. More as time permits. Feel free to ask questions or add suggestions. Yesterday someone asked anout my travels. Here's a quick recap of the 22 month journey. The rest of this blog is the detailed account of those months and what has happened since. In 2012 I retired from an active career in sales and marketing. At the time I was living alone and had a nice place out in the country near Pottsville (Yuengling) PA. Nice, that is, because it was an easy commute to a couple metros where I did most of my sales. Once I quit selling it turned out to be pretty remote from any social life. There were a few bucks in the bank and I debated what to do with the next few years of my life... I bought a BMW motorcycle with the thought of traveling and I upgraded my photo equipment (which I had been involved with since age 7) to an EOS 7D, a 24-70mm and a 100-400MM lens. I spent the year becoming familiar with the new gear and then, January 2nd, 4:00AM my (then 19 y.o.) daughter picked me up with her horse and my bike in the trailer and we headed to FL. She had a 90 day assignment at an eventing barn and I bought the fuel and groceries. I rented a camper near Wildwood and when the 90 days ended she headed home and I headed out on the bike, full time. BMW 650 dual-sport bike, tent, photo gear, computer(2) and a hotspot. I would land a camp hosting assignment (any state/fed park has them) for a month or so and then travel for a few weeks. I did photography along the way with some horse shows, an ad on Craigslist as a photo/video freelancer and posting to facebook pages at the parks where I was working. That year I was always somewhere in the east, until mid September. I got a call from a Bureau of Land Management (BLM) about a 60-day assignment to take pictures of people having fun. She wanted to build her marketing library to match her marketing plan for the following year. I was in SC when I took the call. "Where you calling from?," I asked. "Barstow, CA," she replied, "What would it take to get you out here?" My response was, "What do you have to offer?" That turned into 60 days housing + $35/day in a 28,000 acre section of the Mojave desert called El Mirage Dry Lake. Myself and one volunteer surveyor were the only permanent residents. This is all detailed on my blog. google WhereDoesThatRoadGo. 10,000 frames, one dust storm and a desert snowfall later (the nice thing about photographing people having fun is that they only have fun on Friday, Saturday and Sunday. I would turn in my files on Monday and hit the road for three days). Ending on Thanksgiving weekend, I headed to the Sacramento area for the winter. Lots of pics but no paying gigs. Actually, I did a camp host job for December (free camping), lived on a boat in San Fran in Jan as a renovator and I did a few Mystery shopping assignments. (another story) and then to TX and FL in the spring. In May I had a camp host job here in southern IL right near where I grew up. Plenty of pics, but no pay, just free camping. Good news is that I met someone and we hit it off. Then FL for June and back to IL to nurture the relationship in July. August was wrapping up travels to MN, WI, MI and back to home base in PA. Had a 10 day yardsale and sold everything that didn't fit on the bike. Along the way word spread about my travels and I published a magazine article with BMW Owners Assn and landed a few speaking gigs with motorcycle groups at national events. Pics came in handy for that. I moved back here to IL in Sept of whatever year that was... 2015? Been here ever since with my new love for a life of travel (4 wheels, often referred to as a cage) and photography. 58,000 miles and lots of side stories. No, she doesn't ride. OK, so that's my story and I'm sticking to it. Jus ordered big upgrade to my photo gear and looking forward to another great year. TX and southwest for the winter. See you out there! Modern trials motorcycles are distinctive in that they have evolved to become extremely lightweight, lack seating (they are designed to be ridden standing up) and have suspension travel that is short, relative to a motocross or enduromotorcycle. Back in the late 70's and early '80's I rode this sport called Observed Trials. Great fun. Great exercise and great for the mind. About midway into my second year I started winning and enjoyed competitions even more. My local friends Mike and Spike (brothers) and I rode all over the midwest. As the movie of the same name depicts, "On any Sunday." 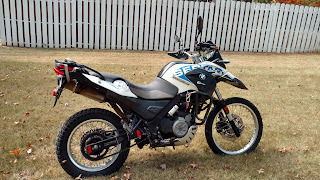 My ride for the past 5 years has been a BMW G650GS Sertao. At 421 pounds, it's nimble offroad and at speed. I enjoy the backroads and firetrails emensely. Problem being, I don't have any local buddies to ride with and I'm not thrilled about being out in the trails withour a partner... It's a lot to carry, if the need should arrise. This summer I happened across a Gas Gas (where do these names come from?) TXT70 trials bike for less $'s than I had in the bank. It's a light weight, but the frame is full size and It will give me enough bike to experiment for a few months to see if I really want to get back in the game. For the first few weeks I did parking lot exercises at a park about a mile from here. Lots of space, some drainage ditches and grass. Didn't take long to figure out two things. A) I'm in terrible physical condition and B) 15 minutes in a parking lot is pretty boring. It's interesting though. I can do 12' diameter circles all day. Throttle control is a bit jerky. Brakes help stability. Now I have an improvement on the practice plan. Two weeks ago I went to a trials training school hosted by Northwest Cycle featuring the 6-time national champion Flying Ryan Young. With 22 riders and a beautiful Saturday we really got worked over and started gaining ground on critical techniques. Ryan took plenty of time adjusting and setting-up each bike before we started training. Handlebars moved forward. Brake pedals leveled, levers turned upward. He explained the logic in each adjustment. OH,,, and 6 PSI front tires with 4PSI rears. Once we started riding Ryan would take 5+ minutes to explain a maneuver and then demo it for us. Once we thought we had it in mind we'd all start riding and executing. Thanks to our host, Jeff, we had plenty of grassy space for initial practice. Balance, front wheel hops, rear wheel hops, tight turns. Best tip on turns was to force youself to move your head over to the outside hand grip and focus on your gloved hand. That really leans the bike down hard to the inside. Then we headed to an up-hill powerline for off-camber turns, clutch friction-point training and downhill braking. After lunch we headed into the woods where Ryan had taped off one "section" for us to practice on. I really sucked on that one. Sunday was more of the same plus floater-turns and flip-turns (in a constant drizzling rain). These turns were way beyond mey skill level at this point. Ryan went over several methods of climbing over logs in different situations. Great fun but my thighs and upper arms were jello by the time we broke for lunch. I headed out early to make the 6 hr drive home, but would (will) do another class next time it's offered. Now then... With that training out of the way, and having heard many of Ryan's stories about his background in trials, I'm back home and working on the basics. I'm in the middle of week two, on my own and not even leaving the garage... All balance and hops for now. Last week I started doing 5 minute exercises every hour or so. I ended up with 5 training periods each day for 8 days now. The first few days I would stagger back into the kitchen puffing like crazy. That's already improving. My balance (standing in one place with feet on the pegs and bars turned 45deg, has me staying upright for more than 60 - 120 seconds on most attempts. I work better with the bars turned to the right so this week I'm concentrating on the bars turned to the left. Once I get my position it's a feeling like I have a 4" wide column of safe space that I need to keep my frame within. Ryan explained to use the bars to keep centered and turn the bars in the direction you feel you are falling to find suppport. Easier said than done but it's improving. For starters I tried wedging the front wheel against a stair to the kitchen. That gave me just a bit of side-to-side support to make balancing easy. Once I was up on the pegs I worked on getting steady and gradually moved away from the stair and out on open floor. AS I am gaining balance I'm working the bars for support as I lean to one side or the other and then bounce on the pegs to get ready for wheel hops. Amazing how much energy this takes, even when just standing still. Watching BMW Trophy Challenger winner Tom Thomas float over the course in Bixby MO this summer, I can see how his trials background gave him a leg up on the competition. More to follow this afternoon. 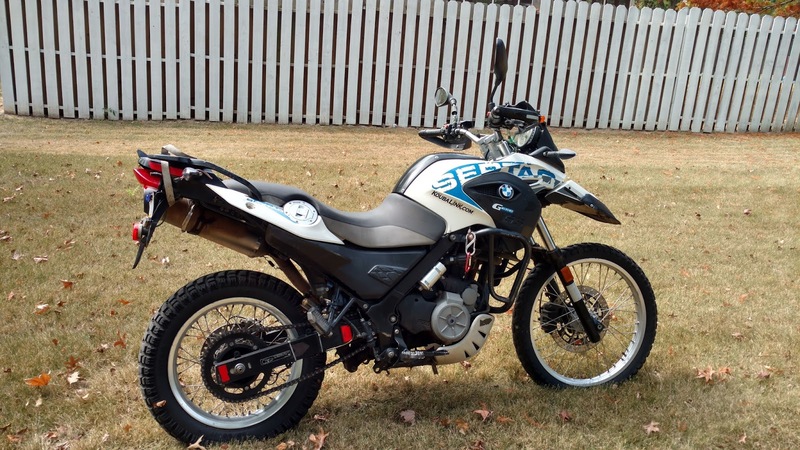 After considerable debate, mostly with myself, I decided to sell my 2012 BMW G650GS Sertao! 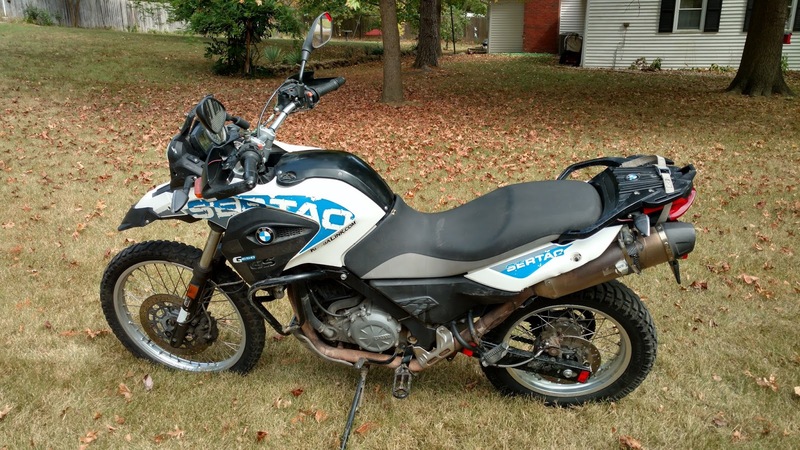 Will take $5,000 or will consider trading for a camper (best option) or a BMW road bike and forgo the Dusl Sport functionality which served me so well. What will this bike do for you? Point it up a gulch and roll on the throttle... It will take you to the top. Hang on and steer with the pegs. Sand? Ask the Florida Cads peeps... roll on the throttle and lean back. Last trip following the leader was 25 miles of 10" deep sand and we never missed a beat. Bootlegger 1200? Climbed every challenge... no prob. BMW Performance Center? Took on every obstacle. GS Giant Events? In Ashville I placed third for the Gypsy Tour. 'nuf said. Lots of stories to share about the history of this bike, but that can follow. Featured in magazines, won awards at ralleys, been across the country and back. Time to let someone else enjoy this remarkable dual-sport bike and take on a more laid-back riding style. Booster Plug (increases low end HP about 5% DETAILS <<< "Best $150 I ever spent." 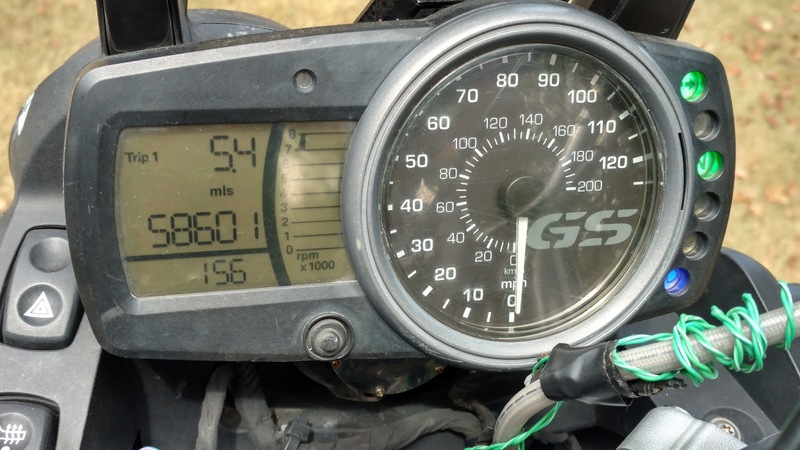 I installed it when the bike was under 1,000 miles and hardly ever killed the engine since. H4 LED headlight from ADV Monster. <<< HUGE improvement. Installed at NEFL rally 2015. Turturo Chain Oiler. Details <<< From the UK but has a dealer in the US. Only operates when bike is moving and hitting bumps. Completely independent of bike electronics. Read the details. Oversized foot pegs. e·quiv·a·lent to power steering when off road. Fuse block added for additional accessories. DOT plugs wired at rear for additional turn indicators and brake lights which were mounted in my panniers and top box. Heated grips failed. Could be switch issue. Emergency flasher function failed. Could be switch or flasher timer. One rear turn indicator is missing the lens but flashes. Tool compartment lock failed. Drilled the lock and has a strap to hole it in place. Seat release latch handle. Came unhooked and vanished. Use your bare hand or pair of pliers. This bike was not ridden insanely by a crazy person. I'm 69 years old and bought it 5 years ago when I returned to motorcycle riding. Loves sand! I did the ADV and CADS trans Florida rides 5 times. Worked for two months in the Mohave Desert (El Mirage Dry Lake, CA.) Competed in the BNW Trophy Challenge in SC in 2013. Why selling? My lifestyle had morphed into more casual and less opportunity to ride off-road. As a result I have packed on about 25 pounds and gotten really out of shape. I would like to find an older more classic style BMW to do road trips and camping. My g/f doesn't ride so it's just going to be something that I enjoy on my own. Open for ideas. Cash is always an option. Also: 4 rear tires, one highway, others dual sport. You can skip over this page... I just need a place to store links to info on the Trials bike I just bought. If you have related info don't hesitate to comment or email things to me. I would go with 1.5 oz of synthetic two stroke oil per gallon of gas. 80:1. I should be able to order the rubber boot but do not have it in stock. The transmission should take about 300-400 cc of oil. Most Gas Gas owners use ATF type F. For anti-freeze the type formulated for aluminum and magnesium engine parts is best like the factory Motul. Per Kevin at RYPUSA: Contact Stu at Jack’s cycle 207-337-1274 for parts. Stu thinks he can get the boot between the carb and the engine and an airfilter. Both are working but look like they are ready to disintegrate. Update: Stu took info and had parts shipped pronto! Parts came from TRS Motorcycles, Earl Park, IN 47942 219-474-6656 www.TRSMotoUSA.com. They shipped the parts and then called me for credit card info later. Nice! Clutch: I drained the oil and measured 500ml. Refilled with fresh ATF type F.
I had the opportunity to witness and photograph the remarkable 2017 Kenda Tennessee Knockout Enduro (TKO) at the US Trials Training Center in Sequatchie, TN back in August. Between Saturday and Sunday of the weekend I mnaged to shoot over 5,000 frames of the riders and facility. At 7 frames / second there are plenty of near duplicates, but i'm sorting through them to pull out the best of as many riders as I can manage. My eyes are blurring and my patience isn't what it used to be, but I'm ready to post links to some of them. Eventually they will be posted on my Photo Gallery at www.PhotoKurtz.com. The direct link to the album is HERE <<<. So far I have edited about 200 shots and am in the process of getting them loaded... it's a slow process. If there is anything you see that you like you can purchase them right on line. If you need high res digitals for publication please contact me directly. Keep in mind... if I have one shot of you it is probably selected from several in quick succession. It is very time consuming to process these to print quality, but if you want to see if I have others of you or your fav rider just give me a call and I[ll see what I can come up with. Happy Day! Let's all get there again next year. This will include calculating ( or looking up) precise observation times, definitions, experimenting with several cameras and lots of wine. Stay tuned... this is a developing story. Here's an app that came highly recommended. $1.99+tx. With just a couple minutes practice I had it find my location and calculate a few event times. 1st Contact: Don't look yet! first contact — during a solar eclipse, the moment that the Moon makes contact with the Sun; the beginning of the eclipse. second contact — during a total solar eclipse, the moment the Moon covers 100 percent of the Sun’s disk; the instant totality begins. third contact — during a total solar eclipse, the instant totality ends. fourth contact — during a solar eclipse, the moment that the disk of the Moon breaks contact with the Sun; the end of the eclipse. That means the event actually lasts 2 hours 54 minutes and 58 seconds? Will confirm. Continuing: It is now 11:54 on Thursday. I went out to check the sun position. OK... Interesting observation. Good time to realize how tall our trees are and just where we can be standing at 11:52 when the "First Contact: happens. We are in good shape. Pics to follow. This video was today about noon. This confirms one thought... the sun (at least with some cloud-cover) isn't going to destroy a go-pro. Here's a panorama showing the open sky area from back by the garden. Here is an exposure guide which is referred to by the above article. My camera, when tethered to the computer, can be set to take time lapse pics. When bracketing each frame is the next setting in the bracketing process. ie: Frame 1 is under exposed, frame 2 is correct exposure, frame 3 is over exposed. If I use the 10 second interval I will essentially have 349 sets of photos at each exposure setting. Then I will have second camera (with much shorter focal length lense) to take pics along the way.